The Statue of Liberty is backdropped by the Excalibur Hotel along the Strip in Las Vegas, Nevada. 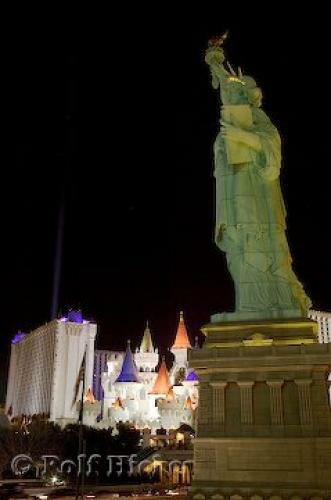 The Statue of Liberty stands in front of the magnificent New York New York Hotel in Las Vegas, Nevada. The exterior of this hotel also displays the Empire State Building, the Brooklyn Bridge and a roller coaster full of screams and excitement. New York New York allows you to get a taste of the big apple and enjoy broadway shows without even visiting the actual city itself. Another outstanding hotel in Las Vegas, Nevada is the Excalibur with its medieval theme on the exterior and interior. The hotel and casino's decor is Arthurian with swords and shields throughout the building and different entertainment occuring in the Medieval village. If you are looking for your knight in shining armor then the Excalibur Hotel in Las Vegas, Nevada might be your first destination. Las Vegas, Nevada is the city that never sleeps and keeps you on your toes with theme related hotels full of gambling, shows and excitement. There is never a dull moment to be had when visiting Las Vegas, Nevada. New York New York Hotel in Las Vegas, Nevada. I photographed this photo with the digital SLR camera model Canon EOS-1DS, aperture of f/11.0, exposure time of 13/10 sec. on ISO 100, as always I used a original Canon Lens, the focus lenght for this picture was 38mm.